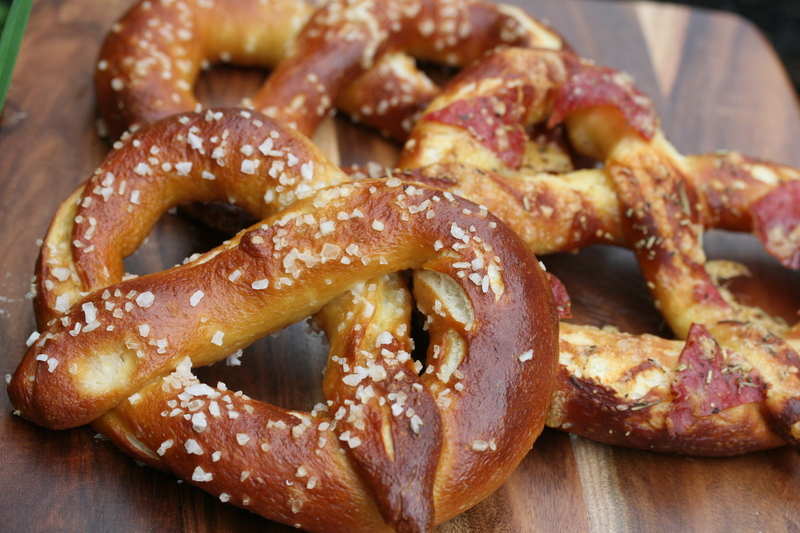 Pretzels are one of my all time favourite snacks. When a pretzel stand opened at my local shopping centre (Garden City, Booragoon for those of you playing along at home) back in 2005/6, I was so excited I think I had one a week for about 4 months. So soft, so salty, so covered in various toppings and with a myriad of dipping sauces. S-J shares a similar love of the baked good and so we decided to get down to the business of pretzel making. This recipe was super forgiving to our extended periods between getting things done. I made the dough base at my house then pootled about getting ready for way longer than the suggested rising time, before jumping in the car and taking the bowl of expanded dough over to S-J’s house for rolling, boiling and baking. We managed to get all of that done (and baked up the dipping sauce) while her small son napped. If that doesn’t tell you this is a recipe for you, I don’t know what will. Pour your warm water, sugar and [kosher] salt into the bowl of a stand mixer and sprinkle the yeast on top. Leave the bowl alone for about five minutes (it should foam). While you wait, measure out your flour and melt the butter. Attach the dough hook (or realise your dough hook is mysteriously AWOL and fudge it with the paddle attachment, oh KitchenAid, is there anything you can’t do?) ready to start kneading. Once you have achieved foam, dump in the flour and pour in the melted butter. Mix on low speed until well combined. Change to medium speed and knead until the dough is smooth and pulls away from the side of the bowl, approximately 4 to 5 minutes (about 3 minutes with the paddle). Remove the dough from the bowl, clean the bowl and then oil it well with vegetable oil (pour a little oil onto some paper towel and wipe this around the bowl). Put the dough back in the bowl, cover with plastic wrap and sit in a warm place (it’s winter here so I set the oven to preheat for 10 minutes, then turned it off and put the bowl in with the door ajar) for approximately 50 to 55 minutes or until the dough has doubled in size. As mentioned, ours was left to prove for over 1.5 hrs with no harm done. Get your oven VERY HOT, preheat to 230 C. Line 2 baking trays with baking paper and lightly brush with the vegetable oil (or do the oily paper towel trick again). Set aside. Bring the 10 cups of water and the baking soda to a rolling boil in an medium saucepan (S-J was in charge of this and a good tip from her is to add the baking soda while the water is cool). You want to make sure that there is a good 3-4 inches of space above the boiling water to allow for the fizz that happens when you add the pretzel in. While the water is coming up to the boil, turn the dough out onto a slightly bench that you have also giving the oiling up treatment to, cut/pull the dough into 8 – 10 equal pieces. Roll out each piece of dough into a 40 – 50 cm rope. “Make a U-shape with the rope, holding the ends of the rope, cross them over each other and press onto the bottom of the U in order to form the shape of a pretzel.” Those are Alton’s instructions, I say go watch a YouTube clip about pretzel shaping, or, get S-J to do it for you because she is a pro! Once you’ve twisted it into shape, lay on the prepared baking trays. Push down on any joins that look like they are coming loose. If there are two of you, you can start a production line of roll, shape, tray, boil, tray, repeat. If not, shape all and then go on the next step. 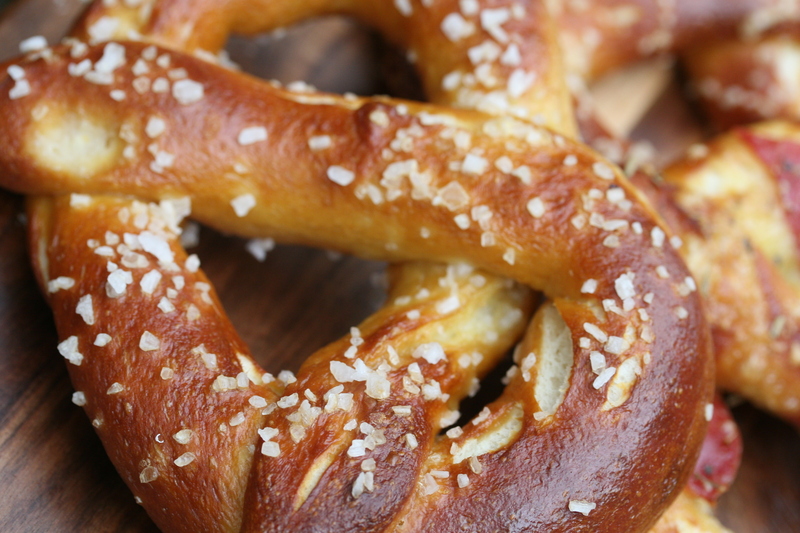 Gently drop the pretzels into the boiling water, one at a time, for 30 seconds. Get them out of the water using a large flat spatula (these suckers are SLIPPERY, do not burn yourself on boiling baking soda water). Try to let the water drip off a little before you put them back on the baking tray. 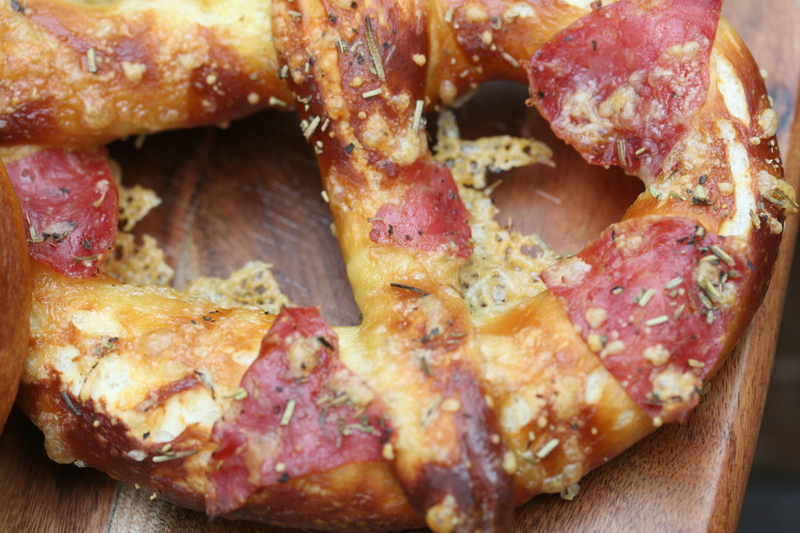 Brush the top of each pretzel with the beaten egg yolk and water mixture and sprinkle with the pretzel salt (or stick little bits of salami on, then sprinkle with cheese and herbs). Put your trays in the oven for 8 minutes, quickly rotate trays and continue cooking for 5 – 8 minutes longer. You want them to be dark golden brown but not burnt. Let the pretzels cool on a rack for about 5 minutes, or until you won’t burn your mouth off.